We’d love your help. Let us know what’s wrong with this preview of A Brush with Shadows by Anna Lee Huber. July 1831. It's been fifteen years since Sebastian Gage has set foot in Langstone Manor. Though he has shared little with his wife, Lady Kiera Darby, about his past, she knows that he plan Sebastian Gage returns home to battle the ghosts of his past and prevent them from destroying his future with Kiera in the latest exciting installment in this national bestselling series. To ask other readers questions about A Brush with Shadows, please sign up. I've given this a B- at AAR, so that's 3.5 stars rounded up. At the end of As Death Draws Near, the fifth book in Anna Lee Huber’s series of historical mysteries, the recently-wed Lady Darby and her husband, private enquiry agent Sebastian Gage, were urgently summoned to England – specifically, to Gage’s family home at Langstone Manor in Dartmoor. Gage’s cousin, Alfred, heir to their grandfather, Viscount Tavistock, has gone missing, and the elderly and ailing viscount wants Gage to find him. Book I've given this a B- at AAR, so that's 3.5 stars rounded up. Book six, A Brush with Shadows, opens with Keira and Gage arriving at the Manor after an arduous journey from Ireland (where they’d solved the case of a murdered nun), and already things are tense. Gage hasn’t visited Langstone since his mother died when he was eighteen, and he had, at that time, vowed never to set foot in the place again. He hasn’t told Keira much about his childhood – he has always been rather cagey when it comes to his past, and she has had to carefully pry information out of him at various points throughout the series – but it’s clear from what he has said that his time there wasn’t happy, and there is no love lost between her husband and his cousin. But Gage is an honourable man and isn’t about to ignore this request for help, no matter that it has come from the family from which he is estranged. Their arrival has clearly not been prepared for, and things go pretty much downhill from then on. Gage’s aunt, Lady Vanessa is openly hostile to both him and Keira, making it clear that she knows about Keira’s background (and the scandal that continues to dog her owing to her forced involvement in her late husband’s anatomical studies – see The Anatomist’s Wife) and strongly disapproves of their marriage. Her younger son, Rory is more welcoming, while the viscount continues to tyrannise the household from his sickbed. And all of them have secrets they are desperate to keep, even at the risk of prolonging the search for Alfred who, it turns out, vanished almost a fortnight earlier. I freely admit that the big draw – for me – of this book was the opportunity to discover more about Gage’s past. He’s such a lovely hero – clever, well-liked, handsome, charming, and urbane, but there’s been an aura of mystery about him and the sense that he’s suffered some deep hurt that he is at pains to keep hidden. He has always played his cards close to his chest and at times, Keira has despaired of his ever really opening up to her, but as the series has progressed he has done so occasionally – about his experiences in Greece in the war against Turkey and confessing that his mother was murdered (poisoned) by her maid – even though he finds it incredibly difficult and has taken care to pack all his most disturbing memories away behind thickly constructed mental walls. The picture of the younger Gage that emerges here is heart-breaking, but also points strongly to the man he is to become. Forced to assume the role of protector at a young age (his father was often away at sea and his mother was unwell), young Sebastian put up with insults, lies and unpleasant pranks from his cousins and his aunt’s open disdain for both himself and his mother but kept his hurt and frustration to himself so as not to cause Emma Gage any distress. He learned early in life not to rely on anyone else, and even now, continues to display that tendency; although he has learned to trust Keira and knows she is intelligent, strong and capable of looking out for herself, he can’t help wanting to protect her and shield her from unpleasantness. This storyline is much more engaging than the central mystery, which is actually quite weak by comparison – both with Gage’s backstory and with other mysteries in the series. Ms. Huber skilfully weaves the plotline of the missing heir in and out of the threads which reveal more about Gage’s early life at Langstone and his relationships with his relatives, but taken alone, it’s very simplistic and, at times, frustrating. The viscount wants his heir found, but deliberately withholds information from Keira and Gage; his aunt and cousin do the same, there’s talk of a curse, evil pixies who lure people to their deaths on the moor and witchcraft – which all makes for a good crop of red herrings, but there is very little actual substance to the mystery until around the last quarter of the book, when the author ups the ante with another disappearance. And when the identity of the villain was revealed, my reaction was ‘huh?’, because it comes completely out of the blue. I’m not an avid reader of mysteries, but I do enjoy them, and I like to follow the clues along with the characters, trying to work out how they fit into the big picture at the same time as they do. But here, there is no inkling at all as to who the culprit is until Keira actually sees him – and I felt cheated. There was nothing in the entire story that pointed to this person being the miscreant and if felt as though the author had pulled the name out of a hat or closed her eyes and stuck a pin into the list of possibles. On a more positive note, Ms. Huber’s descriptions of the landscape and unpredictable weather patterns of the moor are atmospheric and evocative, and I was pleased to see Keira and Gage working together most of the time (in the last book, they were frequently separated). As I’ve said already, Gage’s backstory is engaging and well-told, and the relationship between our two protagonists continues to evolve in a positive way, as Gage is more vulnerable than we – and Keira – have ever seen him and I loved that he was fully prepared to accept her loving support. Ultimately then, A Brush with Shadows is a bit of a mixed bag. It gets high marks for Gage’s backstory, but a middling grade for a middling mystery, and a cautious recommendation overall. Fans of the series will probably enjoy it for the interplay between the characters and progression in Keira and Gage’s relationship, but those who enjoy a bit more complexity in their historical mysteries might come away a little disappointed. It's always a pleasure to read about Lady Darby and Sebastian! Here we discover what happened with Sebastian's family. And I liked that we get to know his grandfather, his cusins and his aunt, even if they're not a very likable lot! They all treated Sebastian very badly when he was a child. Me, as well as Keira, put some blame on is mother's shoulders too! A nice mistery, even if the culprit is rather unbelievable (view spoiler)[an old man couldn't do what the author made him do! (hide spoiler)]! B It's always a pleasure to read about Lady Darby and Sebastian! I have been anxiously awaiting this book after the little teaser the author left us with at the end of As Death Draws Near, but it was definitely worth the wait. Gage takes Kiera to his home, Langstone Manor. A place he hasn’t been since his mother’s death 15 years ago. His grandfather has summoned him to get there as fast as possible but the trip from Ireland took a little time. They arrive to find the Viscount Tavistock, deathly ill and his heir, Gage’s cousin, Alfred missing. Not sure if has been injured or killed out on the moors, or if he has been kidnapped, or just took off all on his own, his grandfather demands Gage find him. Then Alfred’s brother Rory disappears too. Gage and Kiera step up their investigation to find both men. Could their disappearance have something to do with the past? It is said, Langstone Manor is cursed. Gage vows to find the men and the truth. Another fantastic story from Anna Lee Huber. The cover of this book is breathtaking too. Ms. Huber returns with Kiera and Gage and the servants Bree and Anderley in a story so well written filled with vivid imagery. It is so easy to imagine being in the dark and dim castle or out on the moors or on horseback through the countryside. Gage himself has been a mystery so I truly enjoyed learning about his past and what shaped him into the man he is now. All of Ms. Huber’s stories are very character driven and to peel away some of Gage’s layers was delightful. Kiera is a little nervous to meet Gage’s relatives, but over the years she has learned to cope with those who judge her by her past. She quickly takes every opportunity to spend time with the Viscount. Even sitting at his bedside with her sketchbook while he slumbers to give the servants a break. Gage and Kiera are a wonderful couple, they love and trust each other and are equals, something very strange for this time period. Searching for the missing cousins takes our lead characters visiting neighbors and Bree and Anderley trying to get information from the staff. The author draws readers into the mystery quickly. Searching the vastness of the moors seems impossible, so it was important to look for other clues. Clues at first that were confusing to me as much as Gage and Keira. The twist that revealed what was really happening absolutely shocked me. Wow! I didn’t see that coming at all. Anna Lee Huber is an amazing storyteller. She paints pictures with her words that allow readers to escape fully into her stories. She continues to surpass my expectations. The plotlines are tight, the dialogue is stellar, and her characters leap off the pages. Each story stands on its own, but the Lady Darby mysteries are best enjoyed from the beginning to witness the character development and world building. This book received my Paradise Rating because it deserves more than 5 stars. The is a book not to be missed. This series continues to please. This particular installment takes Kiera and Sebastian to Dartmoor, to his family home, because the heir, Alfred, has disappeared. Alfred has a history of a rather nasty relationship with Gage, and Alfred's mother is the frankly not very nice Vanessa. Anna Lee Huber gives more than a passing nod to ACD's The Hound of the Baskervilles in this one. It's probably impossible for a mystery author to set a mystery on Dartmoor without doing so - and the moor's atmospheric This series continues to please. This particular installment takes Kiera and Sebastian to Dartmoor, to his family home, because the heir, Alfred, has disappeared. Alfred has a history of a rather nasty relationship with Gage, and Alfred's mother is the frankly not very nice Vanessa. Anna Lee Huber gives more than a passing nod to ACD's The Hound of the Baskervilles in this one. It's probably impossible for a mystery author to set a mystery on Dartmoor without doing so - and the moor's atmospherics were a substantial element in the book, along with a family curse. The Lady Darby Series continues to be delightful. In this sixth novel, readers get to know Sebastian Gage's family. Gage has been disconnected from them for years, but was asked by his grandfather to return and find his missing cousin. In typical fashion, the scenery and mood come alive under the pen of Anna Lee Huber. The villain was quite a surprise. Thankfully, the end alludes to the series continuing. My gratitude to the author and publisher Berkley for a complimentary NetGalley copy of the no The Lady Darby Series continues to be delightful. In this sixth novel, readers get to know Sebastian Gage's family. Gage has been disconnected from them for years, but was asked by his grandfather to return and find his missing cousin. "The first time I laid eyes on Langstone Manor I could not blame my husband for staying away for over fifteen years." So begins Anna Lee Huber's 6th Lady Darby Mystery. I discovered her Lady Darby series a little over a year ago with the very first, The Anatomist's Wife, and was captivated by the beauty of her writing. I was able to read the first few one right after the other. There is also a novella. Sebastian Gage reluctantly goes back to his childhood home in Dartmoor at the urgent request of "The first time I laid eyes on Langstone Manor I could not blame my husband for staying away for over fifteen years." Sebastian Gage reluctantly goes back to his childhood home in Dartmoor at the urgent request of his very ill grandfather, the Viscount Tavistock. It seems his cousin Albert is missing and his help as an inquiry agent is needed, as is his wife's, Lady Kiera Darby, Mrs. Gage. Returning to this place is extremely unsettling to Gage as it holds many unhappy memories and also the place of his dear mother's death. He must battle all these ghosts of his past if he hopes to have a happy future. Kiera suspects there is much that Gage has not told her and hopes that he can achieve some sort of peace from this visit. Strange things are afoot in Langstone Manor. Nothing, it would seem, is as it appears at first. Gage and Kiera must watch out constantly for danger as they inquire into Albert's disappearance, who wandered out on the moors and completely disappeared. The moors are a terrible place to be, warns nearly everyone they come in contact with, yet here they must search if they are to have a hope of finding Albert. The Viscount is certain that something other than a natural hazard is to blame for Albert's disappearance. Then Albert's brother, Rory, also goes missing. Gage and Kiera must battle local superstition, which runs rampant, to expose the reason behind these disappearances before someone else goes missing and the moors take yet another victim. I love Anna Lee Huber's writing. She is extremely skillful at drawing her readers in from the very first sentence. Seriously. Told in the first person from Kiera, Lady Darby's viewpoint, they are completely mesmerizing. Huber goes into great detail in every scene, letting readers actually see inside Lady Darby's mind. The reader misses nothing in the books, always looking out into the world of the time from her eyes. As Huber describes the moors, I felt as if I were there, riding along with the characters on horseback, trying to solve the mysteries. And she does a mystery very well indeed, I might add. So well that the reader feels sure they have guessed the culprit, then finding themselves completely surprised at the ending. I love these mysteries of hers and the moment I finish one, I am anticipating the very next one. Especially since Huber includes a very delightful surprise at the end. No spoilers. You'll have to read it for yourself. I enjoyed every moment. *My thanks to the publisher for a complimentary copy of this book via Net Galley. The opinions stated here are entirely my own and honest. The last Lady Darby book was a little bit of a left down for me. That said, I was eager to see what this book held because I really love Anna Lee Huber’s books, not just the Lady Darby books, but all of her books! The thing that excited me most about this book was the eye catching cover. I totally need this sunny yellow dress to wear around town….it’s beautiful. I was absolutely in love with this cover…..yes I know that’s terrible but it’s the truth. I was happy to read this because the happy yel The last Lady Darby book was a little bit of a left down for me. That said, I was eager to see what this book held because I really love Anna Lee Huber’s books, not just the Lady Darby books, but all of her books! The thing that excited me most about this book was the eye catching cover. I totally need this sunny yellow dress to wear around town….it’s beautiful. I was absolutely in love with this cover…..yes I know that’s terrible but it’s the truth. I was happy to read this because the happy yellow dress made it so….especially on the cliffs of the moors. SOLD. This book had to do a lot in the way of redemption for me, mostly because in the last book Gage and Kiera hardly worked ‘together’ and with the description promising so much detail about Sebastian’s past, this book HAD to be good or else I might have to move on. And let me just tell you…..this book delivered in a big way for me. Not only were Gage and Kiera working together more and sharing theories, but Kiera took the lead and more of an independent and impartial investigator which was refreshing. I loved how exposed Gage’s character was throughout the novel and how his past was like a raw nerve. I really felt the pain he had endured throughout most of his life. It jumped off the pages and took on a life of it’s own, well done! Though not much happened in the romantic sense, there were plenty of tender moments and stolen kisses to satisfy readers who were looking for more chemistry between Gage and Kiera. Though the romance wasn’t the focus of the book as it has been in previous novels, this book had more romance than in the last book. Normally I might rate this book 4 stars but I went for the 5 and here is why. Atmosphere. I am a huge huge huge suckers for books set on the moors. I love the moors and the mystery, haunting intrigue, and moody ambiance they have come to symbolize. I could close my eyes and feel the mist in this book. I loved how much the setting added to the mystery and how big of a role it was in the narrative. It almost took on a life of it’s own and I adored it. I can’t say enough great things about the setting of this book. I think one thing worth mentioning….if you are a fan of Huber’s writing like I am, you might feel like you have read a story like this before. I recently read the first Verity Kent book and this latest Lady Darby installment had similarities within the plot. It wasn’t like a copy cat or anything but I could tell that there were some similarities. I personally didn’t mind at all, I rather enjoyed it but I thought it worth mentioning all the same. If you haven’t discovered Huber’s novels you need to. Any of them. All of them. She has a wonderful talent and I love how she uses the English country side to add to her atmosphere and mood within the novels. Well done! I finished this book with a contented sigh and anticipation for the next book in the Lady Darby series. Anna Lee Huber has done a marvelous job guiding fans of Kiera and Gage through a series of mysteries, near death experiences, friendship turning to something more, marriage, and now the duo are pulled into a an inquiry involving the disappearance of Gage's cousin, Alfred, heir to Langstone Manor. Devoted fans of the Lady Darby series recall that Gage's life has been filled with contention with I finished this book with a contented sigh and anticipation for the next book in the Lady Darby series. Anna Lee Huber has done a marvelous job guiding fans of Kiera and Gage through a series of mysteries, near death experiences, friendship turning to something more, marriage, and now the duo are pulled into a an inquiry involving the disappearance of Gage's cousin, Alfred, heir to Langstone Manor. Devoted fans of the Lady Darby series recall that Gage's life has been filled with contention with his family. He returns to his family home at the urgent request of his grandfather to find his missing cousin. Alfred's relationship with Gage was not one of cousinly love; rather Alfred was a straight up rotter. As an adult, Alfred seemed to continue in his rotten habits and his absence wouldn't be sorely missed by many. Familial duty ensures that Gage and Kiera determine whether Alfred was met with foul play. The pair find themselves embroiled in poisoning, hints of witchcraft, pixie lore in the moors, and family secrets someone wants buried... and won't stop at simply burying the truth. I found this mystery to be filled with action and clues in every chapter. The pace is rapid and you will quickly be absorbed into the book. Keira's love of art and talent with it are utilized, which was one facet of her character that always drew me in. The romance between Gage and Kiera complements the story perfectly without overshadowing the mystery. Long time fans find their relationship strengthening as they encounter situations together as a married couple and also revealing their vulnerabilities. The descriptions of the moors and the weather is hauntingly beautiful. One of my favorite historical mystery series and Huber does not disappoint fans of Kiera and Gage with this one! Mysterious landscapes! Pasts and present collide! What a dynamic duo! Sebastian Gage and his wife, Lady Kiera Darby. As they move forward in their life together Sebastian is called back to the family estate, Langstone Manor, deep in the landscape of Dartmoor. His father is still his supercilious self, as we see from his letters. We learn the story of Gage's upbringing. We meet his truculent and now deathly ill grandfather, the Viscount Tavistock. We come to know about his cousins Alfred and Roland Mysterious landscapes! Pasts and present collide! We learn the story of Gage's upbringing. We meet his truculent and now deathly ill grandfather, the Viscount Tavistock. We come to know about his cousins Alfred and Roland Trevelyan. We are confronted by his aunt the Dowager Baroness Langstone, a darkly forbidding woman with a tongue of ice and a spine of unforgiving steel. We also touch upon Gage's mother, a point of great pain for him. The dark past of the family is exposed, the disappearance of the heir Alfred is urgently addressed by Gage and the mysteries of the past are opened up like festering sores. A read that draws you deeper into Sebastian Gage's life and consequently Kiera's life. A read that doesn't fail to please! I enjoyed the story but I don't think the author used the Moors and the family curse to its full potential. Also, I've noticed in the last couple of books, especially this one, that the author doesn't give Kiera the opportunity to use her medical background. She's fell into more of a questioner role like Sebastian. I kind of liked the series more when she applied her "knowledge of the macabre." *I received this ARC from the Penguin Random House First-to-Read program in exchange for an honest review. Thank you! Fifteen years ago, at the age of eighteen, Sebastian Gage walked away from Langstone Manor and swore he’d never return. Now, it is in view, as cold and brooding as the moors on which it sits. Every nerve in Sebastian’s body is singing and the tension in the coach is palpable. He certainly didn’t want to return, but here he is, all because his grandfather sent him a missive asking him to come and investigate his cousin’s disappearance. He almost didn’t come and probably wouldn’t have if Kiera hadn’t persuaded him to do so. He and Kiera are tired to the bone because they have traveled from Ireland as quickly as possible. Kiera knows that Sebastian’s life here was not a happy one, but, since he won’t talk about it, she has no idea what that life was really like. Upon arrival, they are received very coldly by Sebastian’s aunt – the servants didn’t even know they were coming – nor did his aunt. Then, Sebastian learns that not only is his cousin missing, his grandfather is also at death’s door. Had my aunt and cousins treated me the same way Sebastian's did, I wouldn’t be at all interested in spending my time in a very hostile environment to try to find one of them. However, Sebastian is a very good man and will do what he can to help the family that abused him and his mother. Albert, Sebastian’s older cousin and heir to Sebastian’s grandfather’s title, walked out onto the moors one day and nobody has seen him since. Not a single trace of him is anywhere to be found. Then, Albert’s brother Rory goes missing as well – and in the same manner. Where could they be? How could they just disappear without a trace? Kiera and Gage are having a really hard time with this investigation because the house is filled with secrets and nobody – even Sebastian’s grandfather – is telling them what they need to know. They are doing all of that while trying to protect themselves as well because they have also been attacked. I know every murder mystery has to have a victim, but I really didn’t want it to be this one. I came to like this victim more and more as I read more of the book. The villain is a surprise to the reader and to Gage and Kiera. I am so glad we got to know more of Gage’s early life and that there are some reconciliations. I’m also looking forward to their next case in London and to hopefully see Lord Gage (Sebastian’s father) get a bit of a comeuppance. As always, Huber’s writing is excellent, the story is well plotted and executed, and the characters are fully-developed and engaging. The descriptions of the moors set the mood and immerse the reader in that place and time. You can just feel the fog creeping up around you and surrounding you until you cannot see – and the fear – can you find your way, can you avoid the bogs. Oh! My! Thanks to the Meridian Library for my, copy. As Lady Darby and her husband, Gage leave Ireland, he received a letter from his Grandfather, the Viscount Tavistock to return to his childhood home, Langstone Manor. Arriving there the find that they were not expected and did not receive a friendly welcome. They learn that Gage's cousin, Alford heir to his Grandfather has been missing 10 days and foul play might have occurred. The story takes many twists and turns before the pair find the answer. The Thanks to the Meridian Library for my, copy. As Lady Darby and her husband, Gage leave Ireland, he received a letter from his Grandfather, the Viscount Tavistock to return to his childhood home, Langstone Manor. Arriving there the find that they were not expected and did not receive a friendly welcome. They learn that Gage's cousin, Alford heir to his Grandfather has been missing 10 days and foul play might have occurred. 1) She can't believe Gage's family is so cold. Her family might not be perfect, but they love one another. 2) Her spine tingles a lot. 3) Her hair also stands on end a lot. 4) The weather conditions around the moor are very unpredictable and dangerous. 5) The house is cold. 6) Why can't Gage trust her with all his secrets? 7) Her husband's aunt is a real cow. Unlike the previous installments, this one had almost no historical element. Unless you count the ton's acceptance of all men keeping mistresses and fathering children out of wedlock. It disturbed me, to say the least, and I couldn't fathom why one side character would possibly put herself in the position that she was in. Unfathomable. Really. Finally, the relationship development between the MCs was nice, but the h's insecurities about whether or not she just ruined her marriage by asking the H to have candid conversations about himself and his past grated. She wasn't as insecure as in previous books, but the slow progression, even away from society, does not bode well for the next book. And lastly, I'm not a fan of authors who end their books with things like "if only we knew our happiness would be fleeting" or "I wish we had known our pasts would catch up with us in mere weeks". It makes me feel like I can never enjoy the ending of a story line or like the success and progress that the MCs had achieved in the book that I'd just finished reading. It's annoying and Ms. Huber ends every single book that way. Plus, the foreshadowing (if we can even call it that) refers to the MCs' pasts and if it ends up that one of Gage's ex-lovers is in the picture or he finds out he fathered a baby with another woman, I'm done. So far I have to give credit to this author for never spoiling a book (and hence this series) with OP drama. I hope that she continues this trend. 3.5 stars rounded up. Review to follow at Romantic Historical Reviews. Devoted fans of the Lady Darby series recall that Gage's life has been filled with contention wit I finished this book with a contented sigh and anticipation for the next book in the Lady Darby series. Anna Lee Huber has done a marvelous job guiding fans of Kiera and Gage through a series of mysteries, near death experiences, friendship turning to something more, marriage, and now the duo are pulled into a an inquiry involving the disappearance of Gage's cousin, Alfred, heir to Langstone Manor. 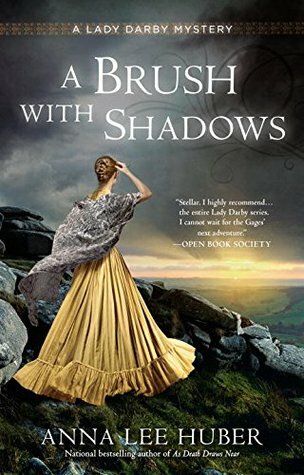 A Brush with Shadows is the sixth book in the Lady Darby series. In this installment, Kiera and Gage travel to Dartmoor to investigate the disappearance of Gage's cousin, Alfred. Kiera and the readers get to meet many new characters, Sebastian's maternal relatives, including his grandfather and see the place where Gage spent most of his childhood. The book started a little slow and it took me a while to get into the story but once it picked up I was absorbed in the mystery and really enjoyed it. 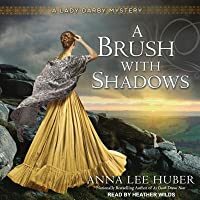 A Brush with Shadows is the sixth book in the Lady Darby series. In this installment, Kiera and Gage travel to Dartmoor to investigate the disappearance of Gage's cousin, Alfred. Kiera and the readers get to meet many new characters, Sebastian's maternal relatives, including his grandfather and see the place where Gage spent most of his childhood. The book started a little slow and it took me a while to get into the story but once it picked up I was absorbed in the mystery and really enjoyed it. I loved the atmospheric setting and enjoyed learning about Sebastian's relationship with his grandfather and cousins. I am looking forward to the next book which will take place in London. Recommends it for: fans of Lady Darby Mysteries. Captivating! Huber delivers another masterpiece in her Lady Darby series. I was immediately drawn into the story from the very first sentence. She pens a great mystery, her pacing is impeccable. But it is her descriptive prose of Langstone Manor and the surrounding moors that immerses the reader in the story. This story is filled with wonderful hints of old folk legends of pixies and witches, old manor houses with secret passages, old family curses and secrets. As Kiera and Gage seek to discover the answer to his cousin's disappearance, they find that the relationship with many family members are still filled with anger and mistrust. I love the chemistry between this newly married couple. Their struggle to share insecurities and vulnerabilities with each other unites rather than divides them, as they face the ghosts of Gage's past. Devoted fans of the Lady Darby series will be happy to know that there are hints of stories to come. I voluntarily reviewed a complimentary copy of this book which I received from the author/publisher. I was not required to write a review. All opinions expressed are my own. I really enjoyed the mystery in this one. It was full of questions and misdirection as they try to discover if there really is a "family curse" that goes back for generations. Gage and Kiera are called back to Gage's childhood home when his grandfather asks them to come find out what happened to his missing heir Albert. Poor Gage hasn't been back for 15 years since his mother's funeral. And these people he calls family are a very nasty lot. Gage hasn't been very open with his wife about his past. I really enjoyed the mystery in this one. It was full of questions and misdirection as they try to discover if there really is a "family curse" that goes back for generations. Gage hasn't been very open with his wife about his past. In fact, she's had to drag whatever she's learned out of him. But in this book we learn a lot more about Gage and his life growing up. And we see the marriage between Gage and Kiera grow and strengthen despite the pain and vulnerability Gage feels confronting some of his demons (or maybe because of them). In this sixth book in the Lady Darby series, Kiera and Gage are summoned by Gage’s maternal grandfather to investigate when his cousin goes missing. Gage’s relationship with that side of his family is strained, and he has not returned to see his relatives since his mother died fifteen years earlier, so the request was both a surprise and one he feels he cannot refuse. It turns out there is good reason for his long absence and his ill feelings towards the people with whom he grew up. Gage and Kier In this sixth book in the Lady Darby series, Kiera and Gage are summoned by Gage’s maternal grandfather to investigate when his cousin goes missing. Gage’s relationship with that side of his family is strained, and he has not returned to see his relatives since his mother died fifteen years earlier, so the request was both a surprise and one he feels he cannot refuse. It turns out there is good reason for his long absence and his ill feelings towards the people with whom he grew up. Gage and Kiera encounter old resentments, a family curse, and treachery from unexpected sources as they try to find his cousin. While at times their investigation seems frustratingly slow, Kiera learns more about her sometimes reticent husband and their relationship becomes even closer. I supposed no matter how old you were, or how long ago your mother had passed, you never stopped wanting her. This is one of my favorite books of the series. Since I'm partial to Gage, I especially enjoyed learning more about his family and past. The mystery aspect was good, but the resolution was a little quick. Loved the ending and can't believe it will be an entire year until I get to see these two again. I liked how Kiera and Gage were able to work together to solve the mystery, weak as it was. Their show of love for each other was something I missed in the last book. I also liked Gage’s backstory. I didn’t really know what to expect, but I’m glad of the attention it was given, although the murder mystery suffered because of it which didn’t really hold up well and was needlessly wasteful of lives. Number 6 in the Lady Darby mystery series finds Kiera and Sebastian Gage called back from an inquiry in Ireland to his maternal grandfather's Langstone Manor. Sebastian's cousin Alfred, the presumptive heir of the estate headed out on the moor one evening and hasn't been heard from since. Has the cousin gone off on a walkabout or has foul play lent a hand in his disappearance? Gage is visibly unsettled as he departed Langstone Manor 15 years prior in a fit of rage following his mother's funeral. Number 6 in the Lady Darby mystery series finds Kiera and Sebastian Gage called back from an inquiry in Ireland to his maternal grandfather's Langstone Manor. Sebastian's cousin Alfred, the presumptive heir of the estate headed out on the moor one evening and hasn't been heard from since. Has the cousin gone off on a walkabout or has foul play lent a hand in his disappearance? Gage is visibly unsettled as he departed Langstone Manor 15 years prior in a fit of rage following his mother's funeral. Before they find out what happened to Alfred, cousin #2 also disappears upon the moor. Are the Pixie's playing games or is there some other horrible devilment afoot? I read this book as a digital galley courtesy of Penguin’s First to Read program. I didn’t know anything about the Lady Darby series before this book and jumped in with no background on these characters. It was easy to pick up, but did make my pace for the first 100 pages slow. Once deep into the mystery, however, I was hooked. Dartmoor is always a great setting for a mystery, and this one is no different. It’s been eight years since I read Hound of the Baskerville and The Moor, but I think I like I read this book as a digital galley courtesy of Penguin’s First to Read program. Dartmoor is always a great setting for a mystery, and this one is no different. It’s been eight years since I read Hound of the Baskerville and The Moor, but I think I liked this outing better than either of them (sorry, Sherlock). Gage’s family home and his relatives make for a wonderfully moody setting and cast of characters. The red herrings were used well. Every plot twist made sense and never felt like it was out of left field. I suspected who our assailant was, but it didn’t hamper the suspense. A Brush with Shadows opens in July 1831 in Dartmoor, England at the ancestral home of Sebastian Gage's mother. The title is very apt and very telling. Right from the start, you are drawn in as the mysteries and atmosphere of Gage's family and the moors themselves weave a sense of foreboding. Sebastian and his wife, Lady Kiera Darby (Mrs. Gage) had received an urgent letter from his grandfather, the Viscount Tavistock, to help find his cousin who has gone missing. There is no love lost between Gage and his family but with the urging of Kiera, they return. I could continue to praise this book for sometime...but I wont. I would, however, urge you to take up this book to learn and uncover the layers of secrets, jealousies, and pain within the Trevelyan family yourself. Along the way, you will learn the mystery surrounding the family's curse, ghosts and loss of those that have gone before them in the shadow of the moors and Langstone Manor. The newly married Lady Keira Darby and Sebastian Gage are still in Ireland after concluding a dangerous investigation when he is urgently summoned by his grandfather, Viscount Tavistock.Gage has not visited his family home on desolate Dartmoor in fifteen years, not since the death of his mother.But his cousin, Alfred, heir to his grandfather and Blackstone Manor, was seen walking out onto the moor and has not returned for several days. Gage has no good memories of his childhood at Blackstone, wh The newly married Lady Keira Darby and Sebastian Gage are still in Ireland after concluding a dangerous investigation when he is urgently summoned by his grandfather, Viscount Tavistock.Gage has not visited his family home on desolate Dartmoor in fifteen years, not since the death of his mother.But his cousin, Alfred, heir to his grandfather and Blackstone Manor, was seen walking out onto the moor and has not returned for several days. Gage has no good memories of his childhood at Blackstone, where he was bullied and bedeviled by Alfred and Alfred's brother, Rory.Gage has always been reticent about his feelings for his family, so Keira hopes that she can learn more and help heal his wounds.Keira has plenty of wounds of her own after her first disastrous and abusive marriage, but she has always had the support of her large and loving family. This one started out super slow for me. I remember thinking at around the 40% mark that perhaps I should let it go.... Then it got interesting all of a sudden. This was a tough read as I adore Gage and revisiting his past with his family was hurtful. My heart ached for the treatment he received from his family. The mystery, was interesting but not in the way of murder initially, more like town mysteries, family secrets and such. My eyebrows touched multiple times trying to piece it all together. This one started out super slow for me. I remember thinking at around the 40% mark that perhaps I should let it go.... Then it got interesting all of a sudden. This was a tough read as I adore Gage and revisiting his past with his family was hurtful. My heart ached for the treatment he received from his family. The mystery, was interesting but not in the way of murder initially, more like town mysteries, family secrets and such. My eyebrows touched multiple times trying to piece it all together. It eventually comes together though. This one took me a while to figure out the culprit. I enjoyed most of the characters, especially the cantankerous old Viscount! He was a hoot but had a soft side. I even eventually started to like the other members of the family *some what* by the end--sometimes you have to look a lot deeper. I was happy to see lots of Gage's valet Anderley and Kiera's maid Bree in this one--I ♥ Bree. Dare I hope she and Anderley may get together? I must say, I'm happy (view spoiler)[ to know that we will have a little Gage and Kiera eventually, though the selfish part of me does wonder how this will impact their investigations (hide spoiler)]. After Ireland and now England, I am ready for them to go back to Scotland. For the slow start, I'm giving the story a 4.5--the last part was that good. Narration is 5 stars, I love how she performs Bree's accent. Lady Kiera Darby is married to a man whose family he has ignored for the last fifteen years. The bitterness of their last interaction at his mother's funeral left him with no desire to ever return. But when his dying grandfather begs Sebastian Gage to return to find his own missing cousin with whom he’d sparred physically and verbally, Gage and Kiera reluctantly oblige. When they return, Gage’s aunt is still as spiteful and bitter toward him and his late mother, and her remaining son just as imp Lady Kiera Darby is married to a man whose family he has ignored for the last fifteen years. The bitterness of their last interaction at his mother's funeral left him with no desire to ever return. But when his dying grandfather begs Sebastian Gage to return to find his own missing cousin with whom he’d sparred physically and verbally, Gage and Kiera reluctantly oblige. When they return, Gage’s aunt is still as spiteful and bitter toward him and his late mother, and her remaining son just as impulsive, even if repentant of his and his brother’s last treatment of their cousin. Additionally, it sees as if a servant, or perhaps one of the residents of Langstone Manor, are playing pranks on Gage and his new wife, a woman whose reputation precedes her, for solving mysteries thanks to her late husband’s surgeon’s obsession with examining cadavers. It will take both of their minds, experiences, and understanding of human nature to solve why first one cousin, then the other disappears, and what to make of the strange dreams Kiera has been having of a man hovering over her bed as she sleeps. A bit slow to start and rather repetitive of the main goal in the beginning chapters, but this book launches into intrigue and remains consistently interesting throughout. Very well researched for the setting and slang of the time period. The author is very knowledgeable of her setting and the customs of the time, creating a very immersive experience once the action begins. I have been enchanted with the Lady Darby series since I discovered it several years ago. I never miss a series entry (in fact, the worst part of being a fan is waiting a year or more in between books), and I was thrilled to read A Brush with Shadows, which begins soon after Kiera and Gage's marriage. Author Anna Lee Huber takes a decidedly gothic turn with this adventure as the couple is called to Langstone Manor, Gage's ancestral home in Dartmoor, England, where his erstwhile cousin has gone mi I have been enchanted with the Lady Darby series since I discovered it several years ago. I never miss a series entry (in fact, the worst part of being a fan is waiting a year or more in between books), and I was thrilled to read A Brush with Shadows, which begins soon after Kiera and Gage's marriage. Author Anna Lee Huber takes a decidedly gothic turn with this adventure as the couple is called to Langstone Manor, Gage's ancestral home in Dartmoor, England, where his erstwhile cousin has gone missing. Gage has had good reasons for not returning home in 15 years, and the couple's reception from other family members is not especially warm. Gage and Kiera find themselves revealing long-hidden family secrets in the course of their investigation, including a legendary family curse and the twisted motives of each member of Gage's immediate family. In less skillful hands, the plot could have lapsed into cliche, but Huber's tale manages to be at once suspenseful and touching, as the reader learns more about Gage, Kiera, and their ever-evolving relationship. They are characters whom we have come to care about and root for as they grow and mature with each book. Although the book stands on its own, this is a series to be savored. Begin with the first one and treat yourself to some wonderful storytelling. Full Disclosure--Net Gallery and the publisher provided me with a digital ARC of this book. This is my honest review.